We all remember where we were when we first saw the devastation of Hurricanes Katrina and Sandy. We all remember the residents who were forced from their homes and separated from their families and their support system. In a better world, we would never have to see such heartbreaking images again. That’s where Garrison Architects come in. 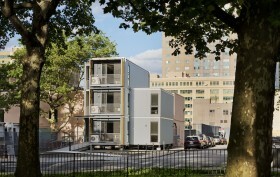 Hired by American Manufactured Structures and Services (AMSS), Garrison Architects has provided a post-disaster urban housing prototype for residents displaced during a crisis.